On Friday 25th July, Richard, Gail, AndyG and another Andy braved the evening traffic on the A55 heading to North Wales. Having dined before setting out, Richard seized the initiative and reached the campsite in Capel Curig whilst the rest of the party were still eating a chip supper in Conway. Tent swiftly erected, he escaped the midges and retreated to the pub to hassle us with text messages. When we arrived, we found that Richard had already returned from the pub. However, once his tent was swiftly erected, AndyG easily persuaded him to go back. Somehow Gail and the other Andy managed not to notice the nearest pub which was a mere thirty yards from the campsite and instead they walked over half a mile through Capel Curig to the Tyn Y Coed. We have still not conclusively established whether this was Gail's usual lackadaisical navigation or whether she and Andy were being deliberately anti-social. 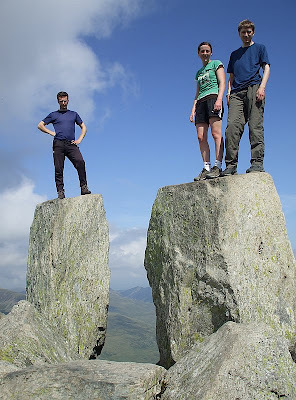 However, next morning saw everyone up bright and early for the walk to the Heather Terrace on Tryfan. Struggling with lack of sleep, an inadequate breakfast and poor hydration, Gail soon came up with the quote of the day, "You guys have just walked up that, like it's a walk!". 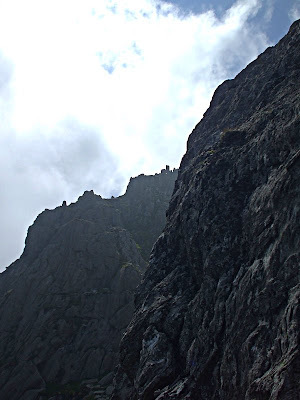 Since we were just strolling along from Tryfan Bach towards the end of the North Ridge at the time, we naturally felt quite justified in pointing out that it really was only "a walk." 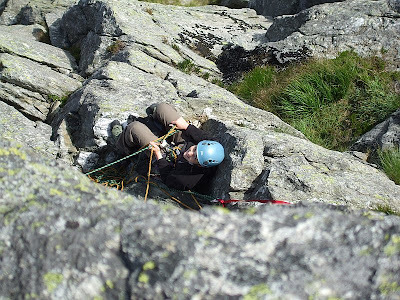 Upon reaching the Heather Terrace, we made our way to the start of Grooved Arete which was the most interesting way for us to gain access to our own objective for the day, Bellevue Bastion. Climbing as two pairs, we made good progress up Grooved Arete behind another party of three climbers who also made short work of the route. After reaching the ledge at the end of the fourth pitch, we scrambled leftwards and upwards to the right hand side of Terrace Wall. Bellevue Bastion(VS 160ft 2*) turned out to be an excellent route. From below it looked very imposing with two roofs blocking the way to the arete which led to the top. However, cunning route finding circumvents the roofs via steep slabs. 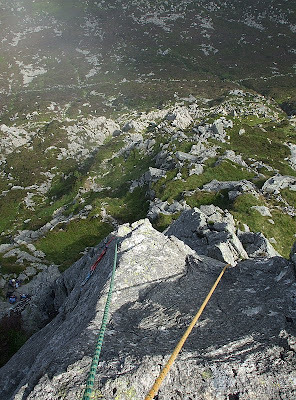 The second pitch, although technically the easier of the two, involves a particularly spectacular step onto a small triangular ledge set right on the front of the arete. 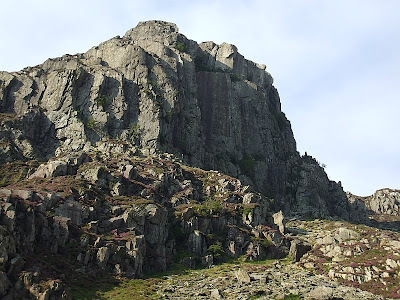 After a short rest and a late lunch, we packed up the climbing gear and scrambled up the North Tower and then on to the main summit of Tryfan. Once on the summit, Andy was easily persuaded to perform the traditional ritual of leaping between Adam and Eve, the two large stones on the top of the mountain. 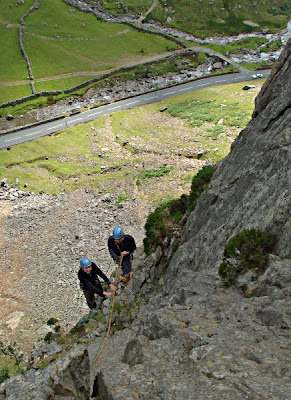 After descending via the South Summit, we made our way down to Bochlwyd Buttress where Richard and the other Andy climbed Five Pitch Route(Severe 110ft) whilst AndyG soloed Arete and Slab(Diff. 110ft) and Two Pitch Route(Severe 100ft). Finally AndyG and Richard both soloed Shadow Arete(Diff. 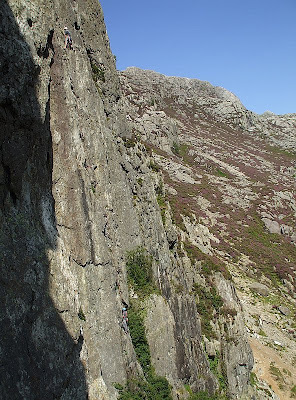 200ft) which although easy by modern standards takes a beautiful line up some remarkably compact rock in a fine position on the extreme left hand side of the crag. We then returned to the campsite for much needed showers and well earned dinner. Next morning saw another early start, as we had arranged to meet Alison, Pope Paul and Mark in the Pass near the Cromlech Boulders. Mark arrived around 8:30am and was soon on his way up to the crag with his mate Steve and Pope Paul. The other Andy set off for a days scrambling up the south side of the Pass, leaving the rest of us to follow Mark up to Dinas Cromlech. 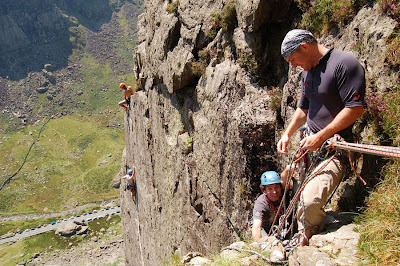 AndyG led Alison up Flying Buttress(V.Diff. 87m 3*) which was her first multi-pitch climb on a mountain crag. And Richard led Gail up Sabre Cut(VS 55m 3*). Meanwhile, Mark led Steve and Paul up Noah's Warning(VS 67m 3*) before trying Cenotaph Corner(E1 5c 37m 3*). Although much of the climb went easily, the crux moves proved to be remarkably strenuous and Mark needed to rest on his gear. After a stop for lunch, Mark continued with Cemetery Gates(E1 5b 52m 3*), seconded by Paul. 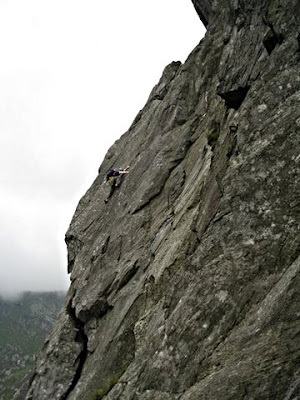 It was Steve's first time on a mountain crag and although he enjoyed himself immensely, he was completely wrecked after seconding Cenotaph Corner, so he decided to give Cemetery Gates a miss. While all that was going on Richard and AndyG climbed Dives/Better Things(HS 4b 60m 3*) before deciding to call it a day. The entire weekend was blessed with remarkably fine weather which caused us all a little sunburn and de-hydration. 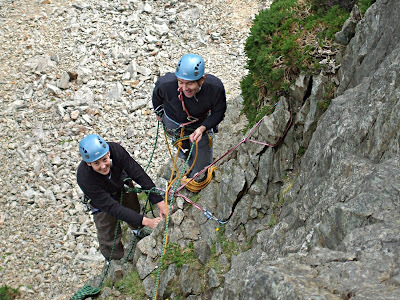 Sunday was a big day out for all concerned, with some brave on-sight climbing from both Richard and Mark, and Alison and Steve both having new experiences on a mountain crag. We were all quite tired and reported exhaustion and a variety of aches and pains when we went to the club meet at the climbing wall on Monday night. The additional photography in this article is courtesy of Mark Stevenson and more of his work can be seen in his UKC photo gallery. Against the advice of their elders and betters, and especially Pope Paul, Graham and Ste ventured into the Lancashire hinterland to sample the delights of Parbold Quarry. 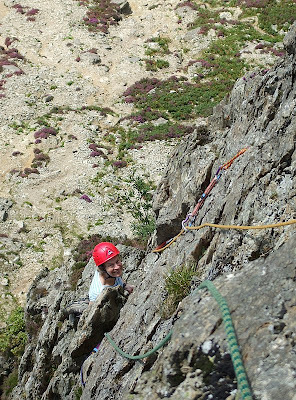 "Start 2m right of the grubby loose arête. 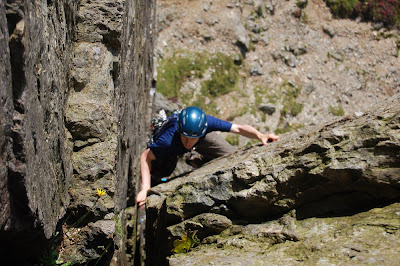 Climb the obvious diagonal line up the mud caked wall for 6m to a slimy shelving ledge(no gear). Baulk at the unprotected tricky mantel and traverse off left to escape down the arête. Truly awful." "Now I can wholeheartedly recommend to those that haven't been there, that they don't go. Ever ever ever ever ever. Unless you want a very unique experience - muddy, manky, damp rock. Yuk. It would possibly be ok-ish after a very long dry spell and a lot of traffic. But this is Britain, and it's in Parbold, so it ain't going to get either of those things." Whilst in the pub following a visit to Cliffhanger on Saturday, Mike, Ian and Sheila discussed the subject of where to climb on Sunday. Ian suggested slate which, after a beer, seemed like a good idea! Graham and Andy C were both keen since Graham had been intrigued by slate for some time and Andy C wanted to try some harder stuff. 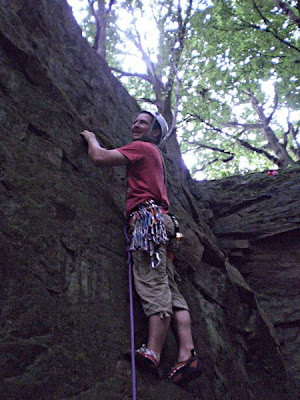 Mike, expecting small crimps and tiny footholds, was a little concerned that everything would be too hard! Fortunately for Mike there has been a lot of development in the quarries recently, and while much of the climbing (particularly the trad) requires levitation skills, there are a few new areas with some more amenable sport climbing. Details of these developments can be found here. After an initial route finding error - resulting in a long walk through a tunnel which exited on a giddy precipice, the correct tunnel was found, and although slightly flooded it did lead to Australia. Andy C seemed to enjoy paddling his way through it, but we later found it is easier and drier to just walk up the paths at the side. Climbing commenced in the Looning the Tube area with the partly bolted trad routes U.B.L. (HS 4b) and Sad Man Who's Sane (VS 4c). Graham used a little too much rope to thread the belay after his lead, and on lowering off found there wasn't enough rope left to reach the ground! Ian and Sheila hung around to do Orangutan Overhang (F6a+), which looked hard with an entertaining roof, while Graham and Andy were taking their Steps of Glory (F5) on the level above - this was a pleasant slab climb that served a taster of things to come. Up again was the Sidings Level, which has some excellent slab routes. These look blank from below, but the tiny holds do become apparent as you move upwards. Mike was told he would need to balance and use his feet to get anywhere, but he proved everyone wrong by finding a few tiny crimps to pull on – somehow even hurting his wrist in the process! We finished the day at Dali’s Hole - another area that has seen extensive development and is popular with groups (it was very busy when we passed it in the morning, but much quieter when we returned after 4pm). Andy C led the fine groove of Zambezi (VS 4c) which apparently has an exciting last third, while Graham & Ian made short work of some more slab climbing. Anyway, a really good day was had by all. The quarries are very open, and because these areas are high up on the sides the quarries they catch the sun for much of the day. It's an ideal place to go to if you're down the pass for the weekend and have had too much of a beasting on the Saturday, and need something more relaxing for the Sunday. There was only one thing missing - no-one fell off, so next time we'll have to up the ante. U.B.L. (HS 4b) - AC led, GC led, MJA 2nd. Sad Man Who's Sane (VS 4c) - ID led, SB 2nd, AC led, GC 2nd, MJA 2nd. Orangutan Overhang (F6a+) - ID led, SB 2nd . The Deceptive Dyke (F5+) - ID led, SB 2nd. Steps of Glory (F5) - AC led, GC led. The Niche aka 'Those who climb clearly marked projects are the kind of people who would steal the chocolate bar from a kids lunch box - selfish tossers, who owe the bolt fund cash' (F5b/c, 2*) - AC led, GC led. The Mallard (F5c, 2*) - AC led, GC led, MJA 2nd, ID led, SB 2nd. Sodor (F5c, 2*) - AC led, GC led, MJA 2nd, SB 2nd. Rack and Pin (F5c, 2*) - AC led, GC 2nd, MJA 2nd. Thomas The Tank (F4a) – SB led, ID 2nd. Derailed (F4b) – MJA led, ID 2nd. Zambesi (VS 4c) - AC led, MJA 2nd. Tolerance (F5a) - ID led, SB 2nd, GC led. Mon Amie (F5b) - GC led, AC led, MJA 2nd. Another trip to North Wales and the Llanberis Pass again.